The pansy is one of the most versatile plants for many regions. It can be grown in most soils without the need for heavy maintenance. It will also spread if the garden or landscape area permits it. The unique face of the flowers makes them popular for many purposes. They can be grown in a container on a patio or given as a gift. They can also be used as edging plants for sidewalks or pathways. Pansies are a common sight for many gardens and flower arrangements. It features delicate petals that are fragrant and vividly colored. These flowers are derived from the viola as a type of garden hybrid. The viola genus offers many variations such as V. tricolor and pumila. There are many hybrids available that offer unique looks and petals. Some hybrids are large while others are smaller in size and bloom. Common garden species often have large blooms and one of many colors. Reds, yellows and oranges are popular but blue and black are common. Many offer color combinations that give them a vivid appearance. Smaller species are available for those who want an English garden. Many of the flowers in these smaller species have delicate petals. The colors may be softer, or feature stripes or contrast edging. 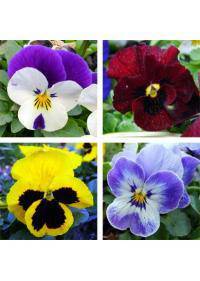 The pansy is easy to grow, making it a top choice for any zone. In colder areas, a more hardy variety should be chosen for results. These are often good for rough soil conditions or different light. Good drainage is essential as they are prone to rotting in wet soil. To get good drainage, the soil should not be packed too tightly. Some may prefer to use these in well drained bed edges or in pots. Partial sun is ideal for growing pansies in the garden or a pot. Shady areas or brightly lit ones will also work, depending on species. Temperature should also be considered as many prefer cooler climates. The plants tend to clump instead of spread, ideal for bare spots. The plants tend to clump instead of spread, ideal for bare spots. Bare spots may be near bed edges or along pathways or containers. Edible blooms make these a popular choice for delicate cuisine. Candied or sugared blossoms may be served as a dessert or on pastries. The fragrance or flavor may also be added to candies or baked dishes. Cake decorations are one of the most common food uses for flowers. These are often combined with a beaten egg and sugar then air dried. Once hardened, they are added to cakes to create delicate additions. Pansies are often harvested and added to salads or fresh dishes. These are often combined with other spring green mixes for salads. Some species have a slight peppery taste that makes them popular. Extracts from pansies are popular for homeopathic therapy medicines. It may also be used to create perfumes or other fragrance products. Softly scented soaps, washes and potpourri also may use pansies. This flower is often used as a symbol of remembrance and memorial. They may be used for a delicate wreath or given as a potted plant. These are often left on memorial stones or markers in cemeteries. The blooms are also a symbol of a deep union and togetherness. This makes them a popular choice for those remembering loved ones. They are often used to evoke fond memories of those who passed on. Pansies also have a strong cultural significance in art and poetry. They have been written into classics by Shakespeare and poetry. The pansy is also a popular subject or addition for many paintings. For all its applications for floral expressions, pansies can be ordered popularly in the following places: Lancaster, CA, Wichita, KS, Fort Lauderdale, FL, Bellevue, WA, and Detroit, MI and more.